Embattled Argentinian President Mauricio Macri has been scrambling to shore up his country's struggling currency since the IMF's executive board finally approved a record - and expanded - $57 billion bailout loan with the explicit condition that the country's central bank refrain from using that money to support the Argentine peso. 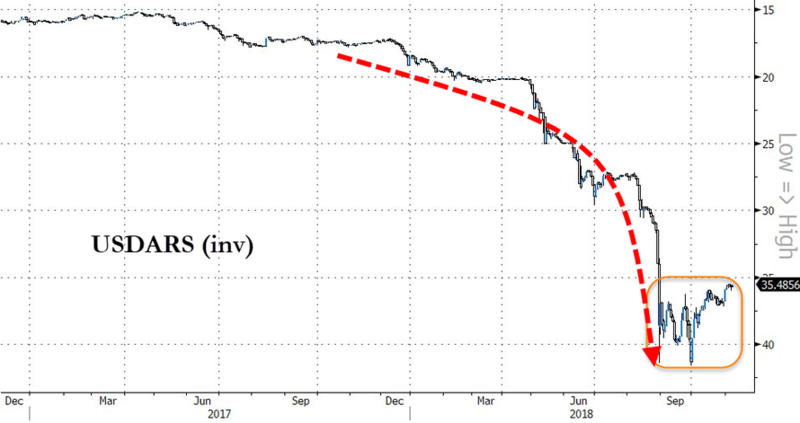 But as Argentina's battered economy has continued to deteriorate, the peso's value has eroded dramatically as the central banks pushed , cementing its status as one of the worst-performing currencies of 2018, as traders ignored a series of frantic rate hikes that brought the overnight interest rate in the country to a staggering 60% (which appears somewhat more appealing next to the country's annualized inflation rate of 40%). With Argentina's economy slipping into a recession back in September, Macri's government imposed strict fiscal controls to try and limit the country's reliance on international debt markets - markets to which it only recently regained access. The country's economic desperation, which has dented Macri's popularity and cast doubt on his chances of winning reelection next year, prompted us to joke a few months back that it might be time for the ECB to jump on the IMF bailout bandwagon. But unfortunately for the West, which sees Argentina and its business-friendly government as a key ally in a region that is slowly falling under Beijing's sphere of influence, the savior that has emerged to shore up the peso, which has stabilized in recent weeks, though it remains near all-time lows, is not what US leaders would have hoped - particularly with this year's G-20 conference, set to take place in Buenos Aires, only days away. As the South China Morning Post reported on Thursday, China and Argentina are nearing a swap deal with China that would add another 60 billion yuan ($8.7 billion) to the Argentine central bank's reserves, an influx of capital explicitly intended to boost confidence in the peso and help alleviate the country's economic crisis before it enters Venezuela territory. The economic lifeline is particularly unnerving given decisions by Honduras and El Salvador to switch their diplomatic recognition from Taipei to Beijing, an unequivocal sign that their political and economic fealty now lies with the PRC. Argentina's recently installed central-bank governor announced the deal during a visit to Beijing, where a delegation of Argentinian economic officials are meeting with representatives of the Communist Party. The delegation reportedly met with PBOC Chairman Yi Gang on Wednesday. "Argentina and China have signed a currency swap totaling 70 billion yuan before, and we are looking to expand it by adding another 60 billion yuan," Guido Sandleris, Argentina’s new central bank governor, said in Beijing on Thursday. The delegations "exchanged views over the financial situations of China and Argentina as well as bilateral financial cooperation," according to state broadcaster CCTV. Ahead of the G-20 summit, President Xi Jinping is expected to visit China. "This is a very important visit and we are going to sign around 30 protocols on all areas," said Diego Ramiro Guelar, Argentina’s ambassador to China. Trump and Xi are expected to meet on the sidelines of the G-20 for their first face-to-face talks on trade since Trump started slapping tariffs on Chinese goods entering the US over the summer. It will also mark the first face-to-face meeting between the two leaders since Trump's visit to Beijing late last year. But as the SCMP, which has ties to the Communist Party, has warned that observers shouldn't expect any breakthroughs on intellectual property or Chinese market access during the talks, the US is bound to view this latest encroachment on its sphere of influence as another deliberate threat.